Day 7 promised a likely return to form. 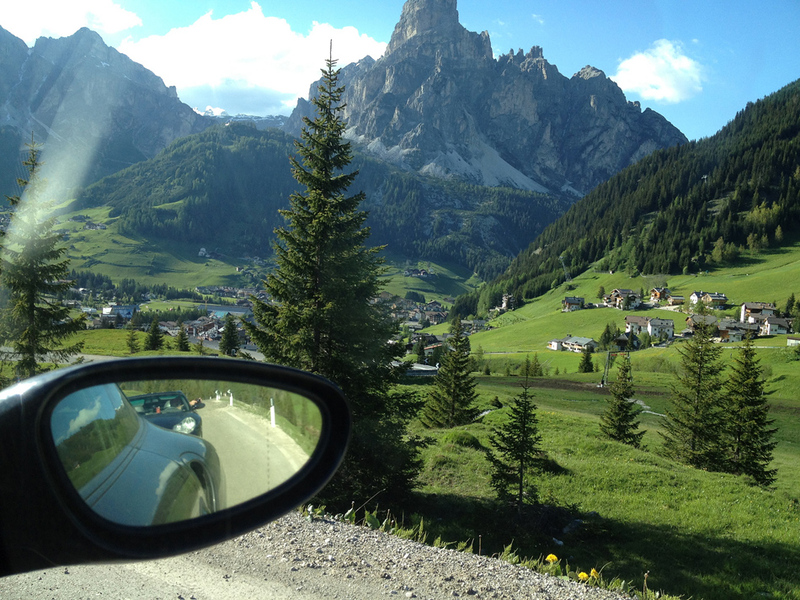 Thankfully the roads through the Dolomites more than lived up to expectations and after a number of days of unremarkeable driving we were blessed with arguably the best day of the whole holiday. There isn't really a lot of detail to mention here and to be honest my memory is a little blank for day 7. I guess I was just enjoying myself so much and so ensconsed in the moment. 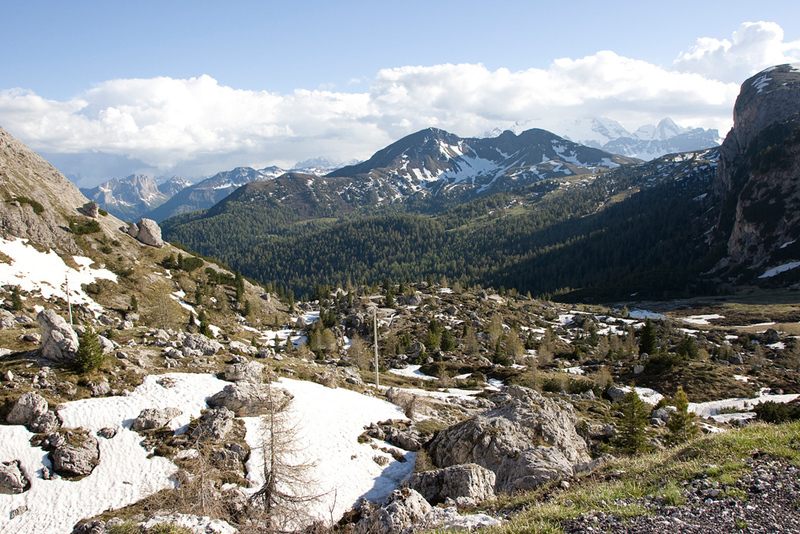 After clearing Jesolo, Treviso and heading towards the mountains it was all really great stuff. The scenery was mindblowing as well and the whole day was just really satisfying. 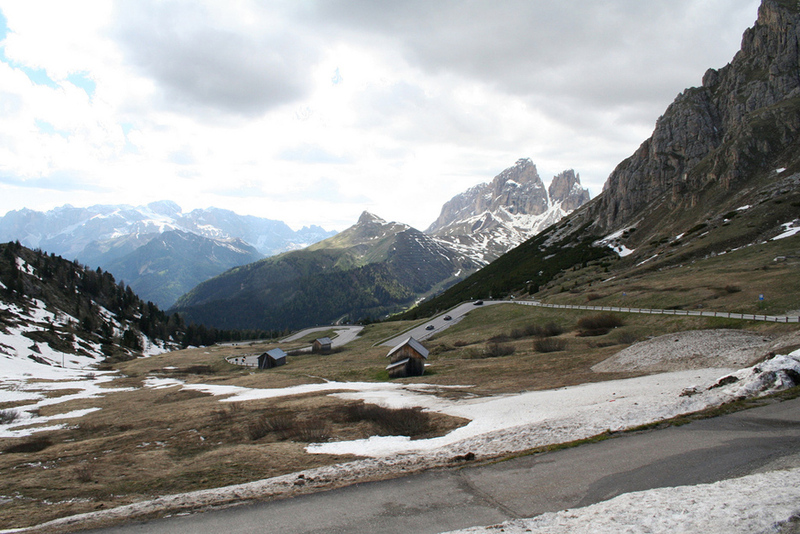 Lunch at san martino di castrozza, just before the Passe Rolle. 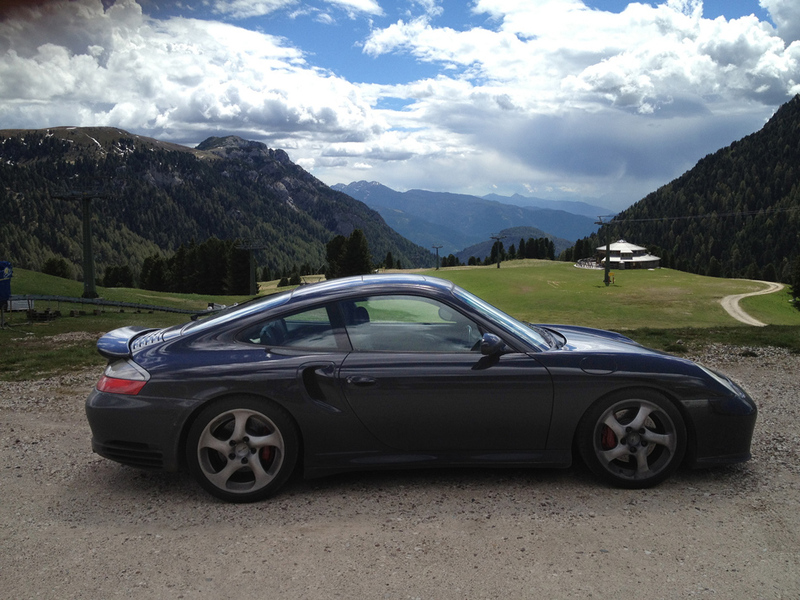 Parked up at the top of the Sella pass. Facing 3 battlement like peaks of Punta Grohmann. One specific point that I do remember well was the most incredible gentle descent that was a never ending left right meander. 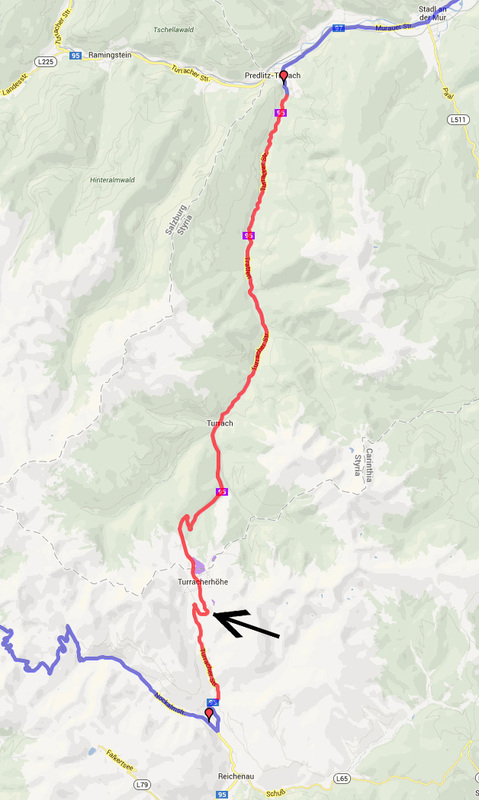 This was the Passo Lavaze or SS620 (marked in red above) that ended with us stopping for fuel at the shell garage at Ponte Nova. When I got out I remember raving that it was the best stretch of tarmac yet and it was just about perfect for the GT3. As with all these roads there are plenty of biking videos on youtube if you care to look. A bit further on further east I know we climbed a lot again and this was followed by another big descent with umpteen sharp hairpins. I did manage to cook my brakes again and had to stop here in Arabba at the bottom of a big descent for a half hour breather. G Man's >500bhp 996 turbo. Had a drive of this on one of the days and on full boost it was shockingly, brutally accelerative. 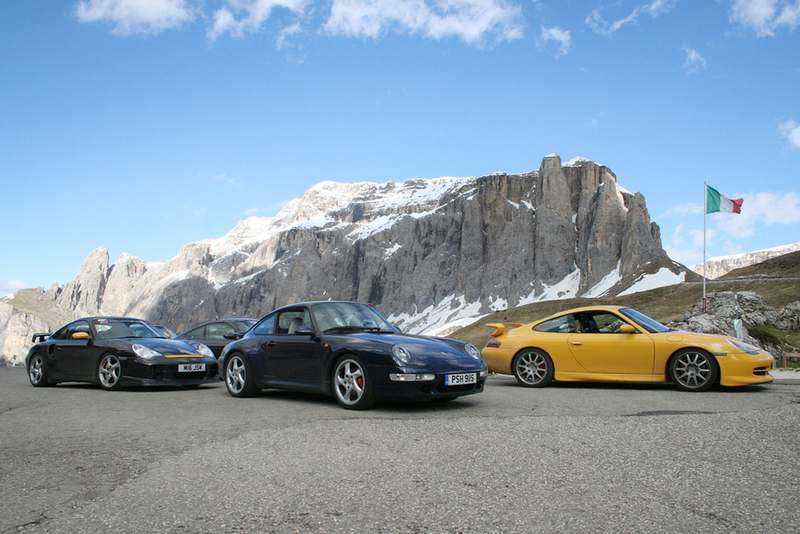 The guys reckon it pulls as hard as the 96 Gt2 and the 997 Turbo S that were in our company as well. The turbo S though with its variable turbine technnology gets its arse moving before both the other cars have had even time to wake up and what's more, it out shifts the others with its lightning quick PDK box so is really in another league in terms of sheer speed. On the route back toward the Austrian border Chris stopped to take a few photos but then couldn't restart the car. It was fairly quickly diagnosed as a faulty earth. The run back east toward and into Austria was very fast and a great finale to the day. Hitting the fast Austrian roads. 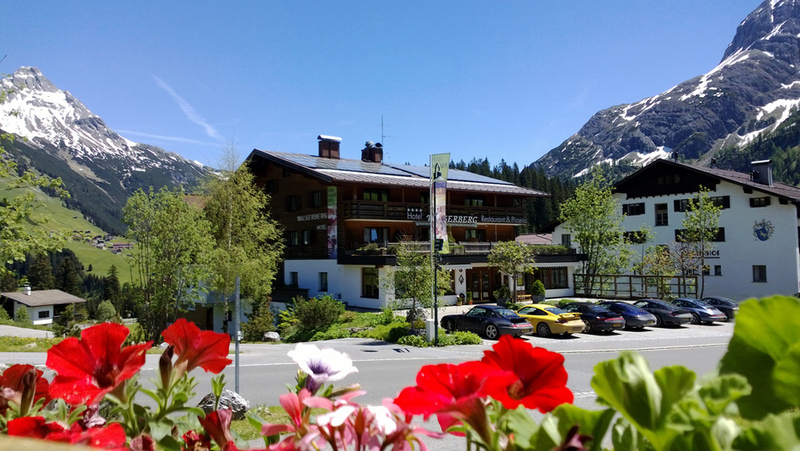 The Grandhotel hotel at Lienz was later voted joint first place as the best hotel of the trip. Not only did they organise our own private section of parking underground purely off their own backs, but the rooms were immaculate with a plethora of freebies and facilites. The breakfast and service was excellent too and overall it was just impossible to fault the place in any way. 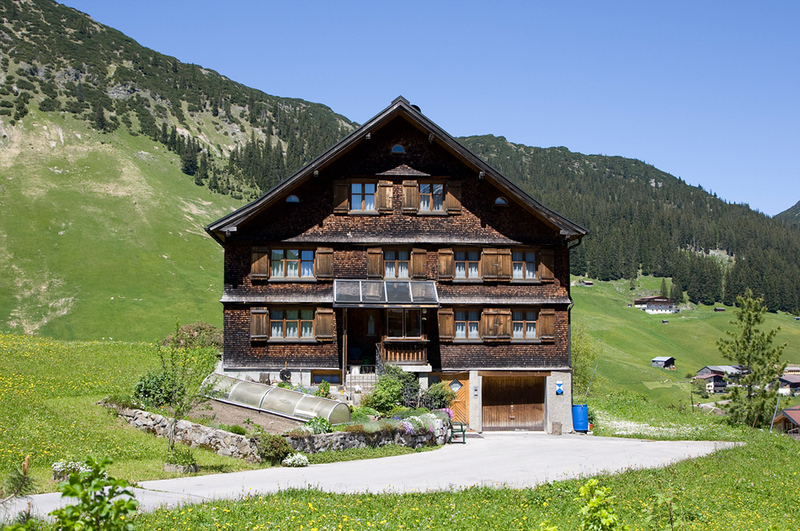 The perfection and efficiency of Austria really shone through at this hotel. As a country it seemed a little anodyne and robotic perhaps but you can only admire Austria for the correctness and exactness of it all. If any day was going to challenge day 7 as the top driving day of the trip it was to be our grand loop around the best of Austria. I have only ever passed through this country so was really looking forward to sampling its delights. Often overlooked in favour of nearby Switzerland, everything I have ever read and heard about the place told me that it could be just as good if not better. 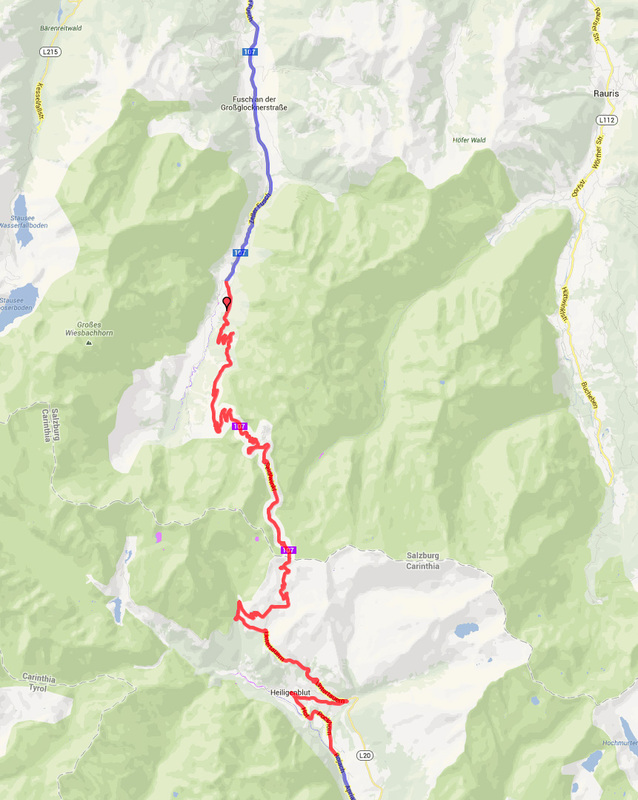 Our circuit began by taking us east of Lienz toward the Nokalmstrasse toll road which is a very popular mountain route for bikers and drivers. Close to Leinz in the more built up areas we did notice quite a generous police presence. We stuck to the speed limits religiously and kept our eyes peeled. Once the roads opened up then it was time to let the taps open. Austria seemed just as I'd discovered when I passed through here back in the 1990's. For the most part the roads are very long and very very fast with gentle curves and a lot of it is flat following the course in a valley of some sort. 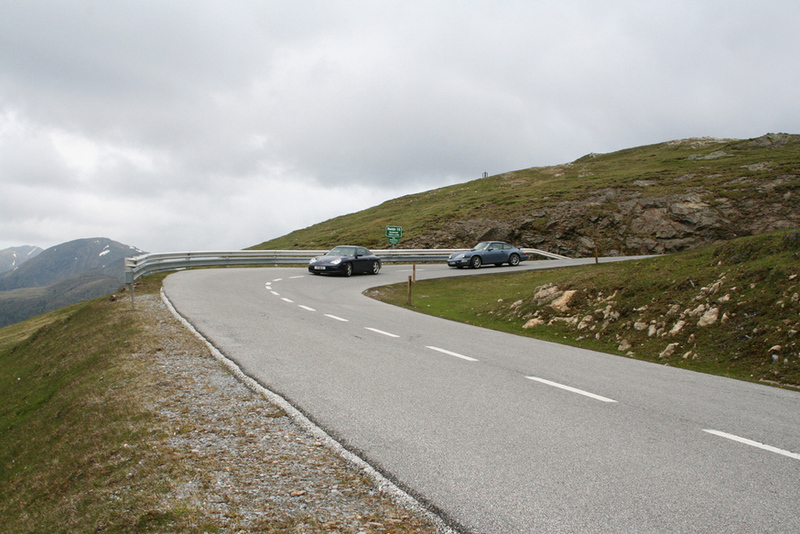 These types of roads are actually great for the GT cars and soon after we began day 8 we all agreed over the radios that wherever 2014's tour was, it should include Austria again. The Nokalmstrasse was located at the eastern lower corner of our loop. The cost was around 16 euros per car. It was a very well kept road with an intial climb, then a levelled off section and a myriad of mostly tighter bends. To be honest though, it was narrower than expected with no protection at the edges and despite the beautiful views, overall a little disappointing. There was something about the nature of it that meant you couldn't really attack it with any gusto. Still, I was glad we travelled this very famous piece of tarmac but if I was returning to this part of the world again I'd probably give it a miss. If the Nokalmstrasse was a little disappointing then the Turracherstrasse was anything but. As we exited the toll gate and turned north, little did we know the uphill stretch of road that lay before us was arguably the finest of the whole trip. This road marked in red was absolute GT heaven. 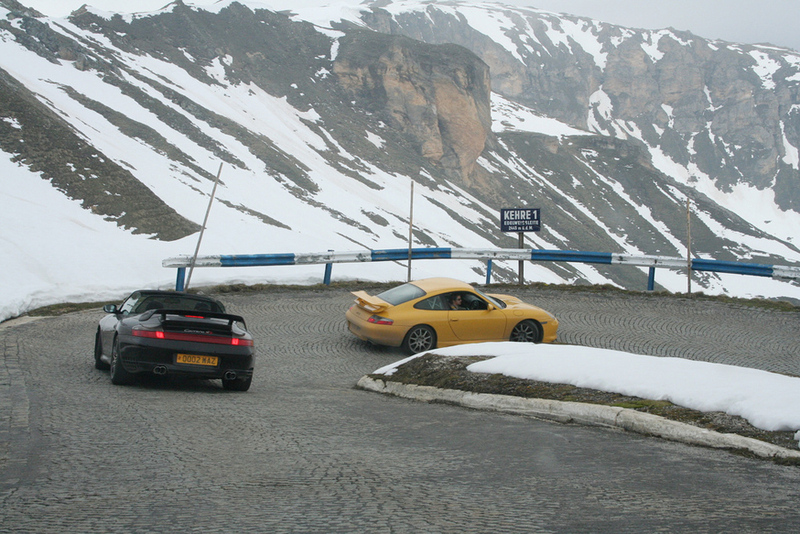 Me and Wiz in his Gt2 were ahead of the pack and we ate this tarmac up like a pair of rabid wolves. Brutally fast, smooth, sweeping with some delicious never-ending sweepers I think I really do have to nominate this as my all time best road for this year. At the finale of the first uphill section was this incredible endless left hander (marked by the big arrow). We hit this at tremendous speed and by the very end of it when we were pointing back on ourselves again, the GT3 had entered the most fabulous gentle 4 wheel drift. Amazing stuff and just so satisfying. It was times like this that proved to me that on the right road, when the route was technical and fast and you drove methodically, exactly, millimetric at the wheel, relaxed back in the seat and just fingertips, not a single unecessary input, with perfect heel and toe, strong deep braking into the corners and early unbridled throttle at the apex, then the GT3 shone brighter than my 993, was far far faster and ultimately just more rewarding. 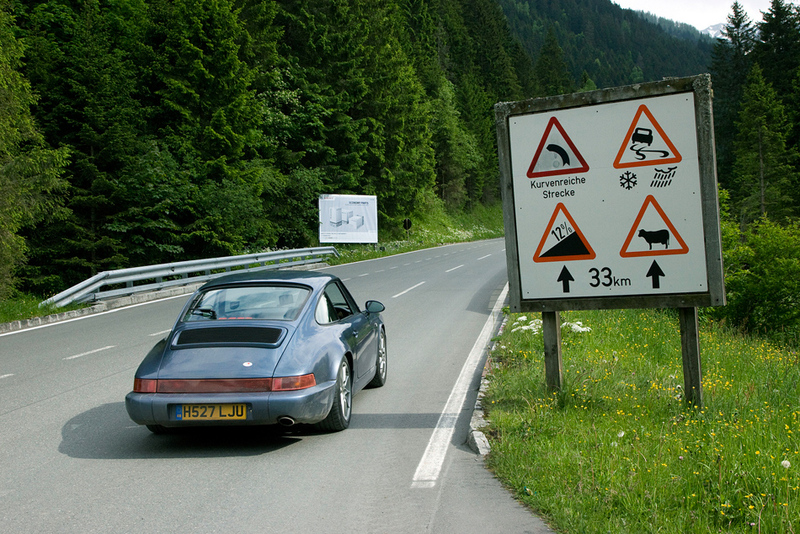 On this type of road, when you could almost have been at Spa instead of some public road in Austria, the precision instrument that is the Mk1 was mighty and very difficult to live with. Even Chimp in his PDK Turbo S said he struggled at times to keep up. That's not bad going for a 15 year old car with 200 bhp less, a manual box, rear wheel drive and save ABS, not a single electronic aid or nanny in sight. The run up the Turracherstrasse was truly epic but the run down was equally as delectable. You can see on the map that this was an endless snaking route closely following the river that went left right left right pretty much till the very end. This was another highly technical section; it was all about turning in at the perfect moment with the car beautifully settled, getting the best entry speed you could and then being as aggressive as you dared through the apex and then quickly preparing the car to turn in the opposite way. As satisfying as a trackday ? I reckon so. 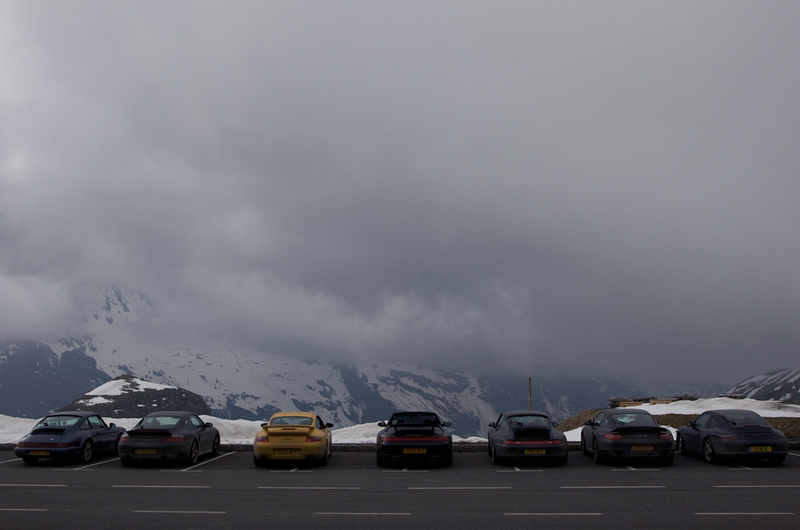 A run westwards and we later hit the main feature of the day, the Grossglockner pass. 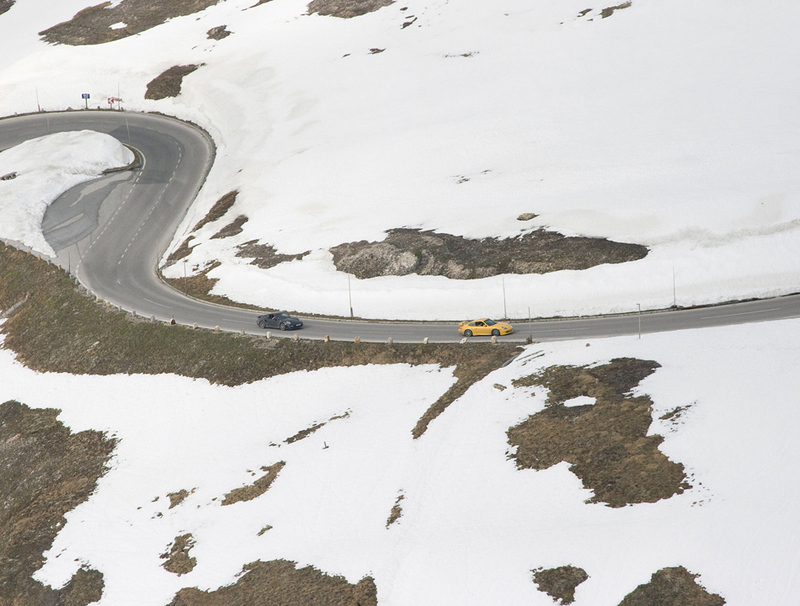 This is a stunning alpine road that climbs to 8451 feet. 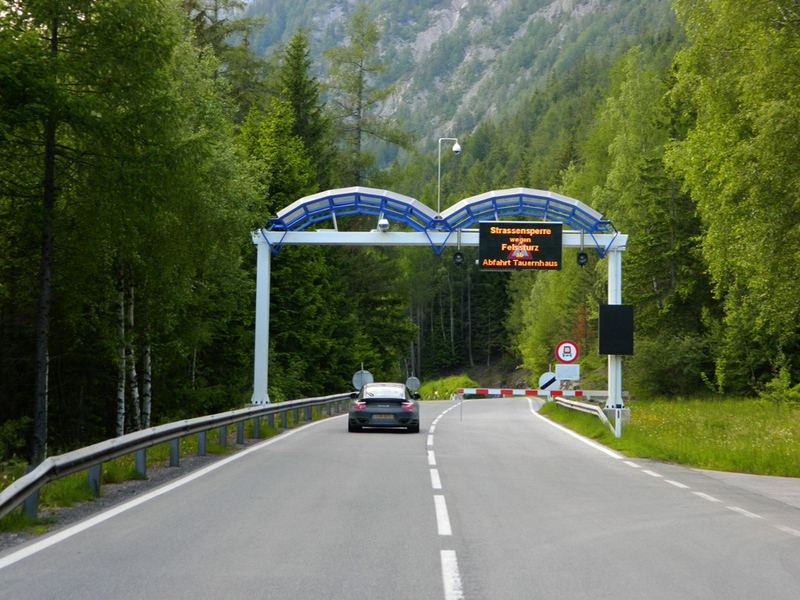 It sees some 270,000 vehicles a year and is one of the most popular tourist spots here in Austria. At the toll entrance (a whopping 30 euros !) there were a lot of disguised BMWs and Minis with tons of telemetric equipment bolted to their dashes. Brembo seemed to be en masse as well so obviously a lot of testing was going on. Luckily there were on a break when we got there though, generally admiring our 8 strong fleet of pork whilst sipping their coffees. 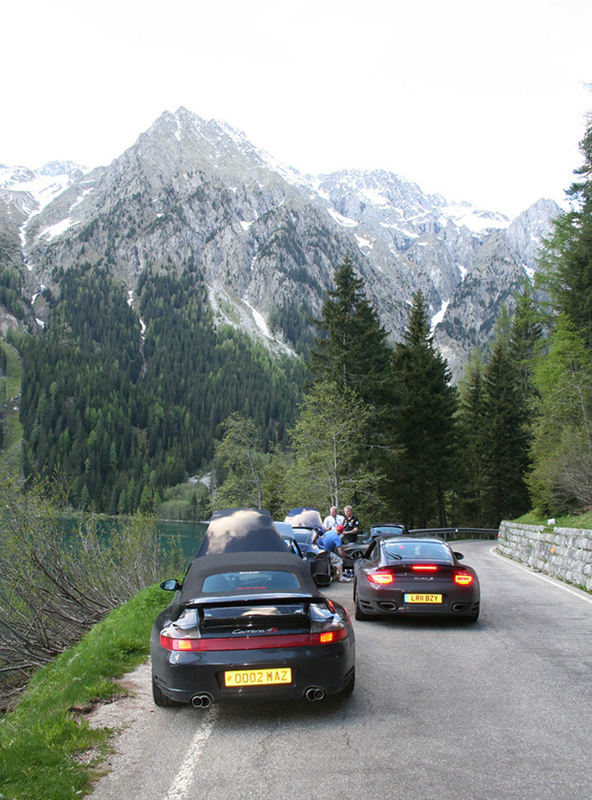 I tackled the first climb on point with Chimp in his 997 Turbo S just behind. With a clear run this was definitely a highlight. 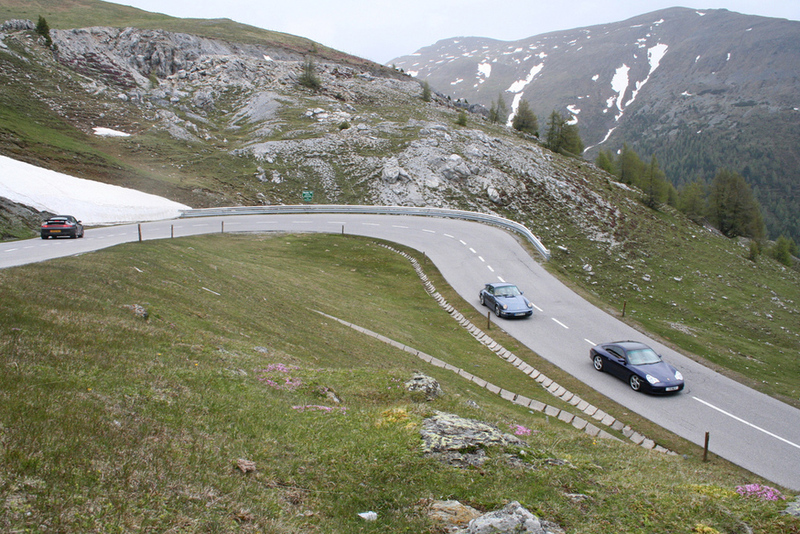 Not quite as epiphanic as the Turracherstrasse but still highly rewarding with plenty of space to fool around on the tighter hairpins. 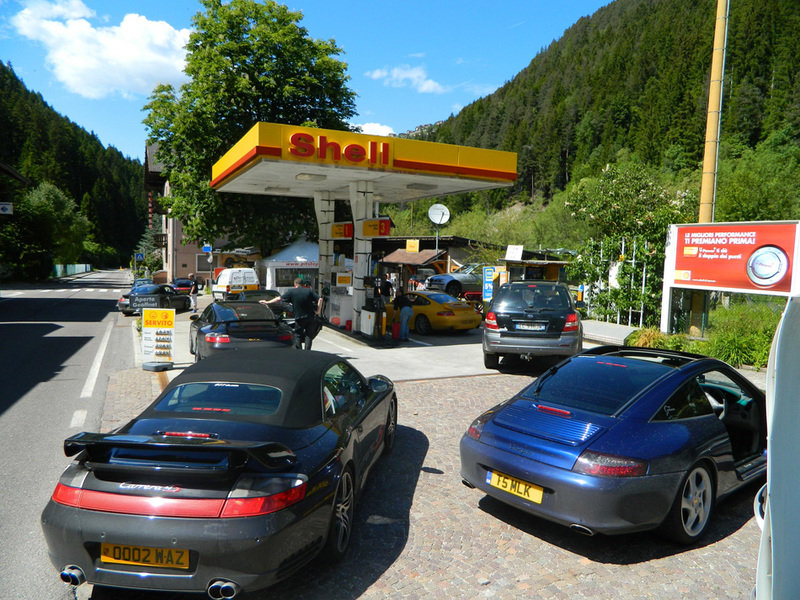 Queuing in readiness to take on the Grossglockner. The slip road, bikers view, which is well worth the extra journey as its even higher than the restaurant. Time for espresso and an apple strudel. 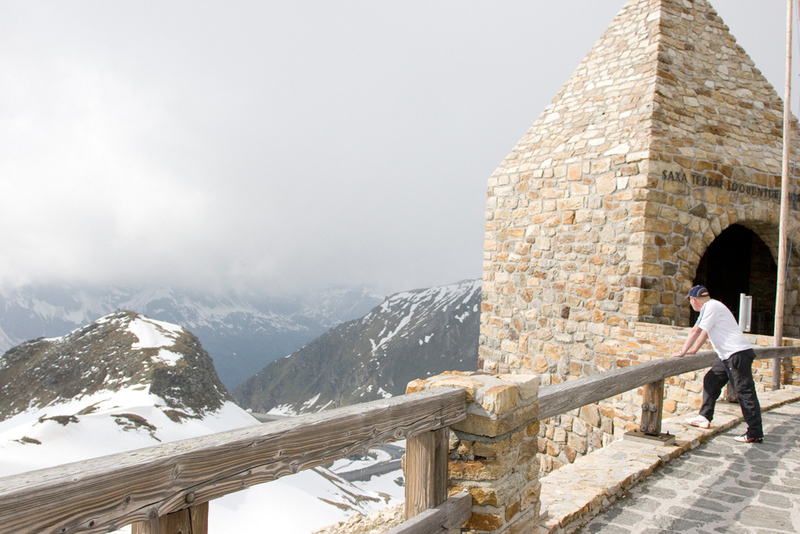 Grossglockner was great. Descending was good fun too. We made a small error though as really we should have driven it back the other way, heading north again the way we came and then onto Gerlos our final destination. I was thinking this as we continued south toward Lienz where we'd started out that morning and thinking how much time it would have saved us. 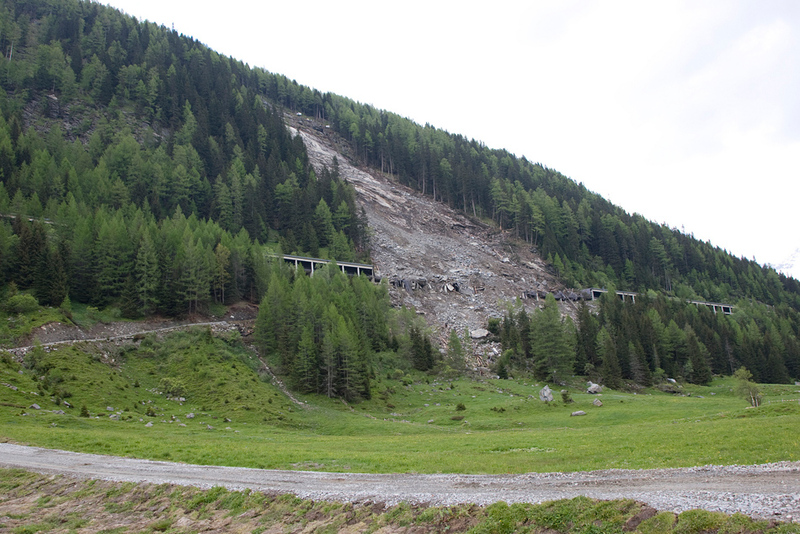 Little did I know that the eventual northern road out of lienz that was to take us back up to Gerlos was closed because of a landslide. Apparently this happened 3 months ago and has been causing havoc in the area and they have even been putting cars on a freight train to get them north again over the alps. Some of the guys drove the 5km past the warning sign to take a look. Quite a sight it was too, the whole of the road had been obliterated. I don't see this being repaired any time soon. This meant we had a tricky and stressful hour. 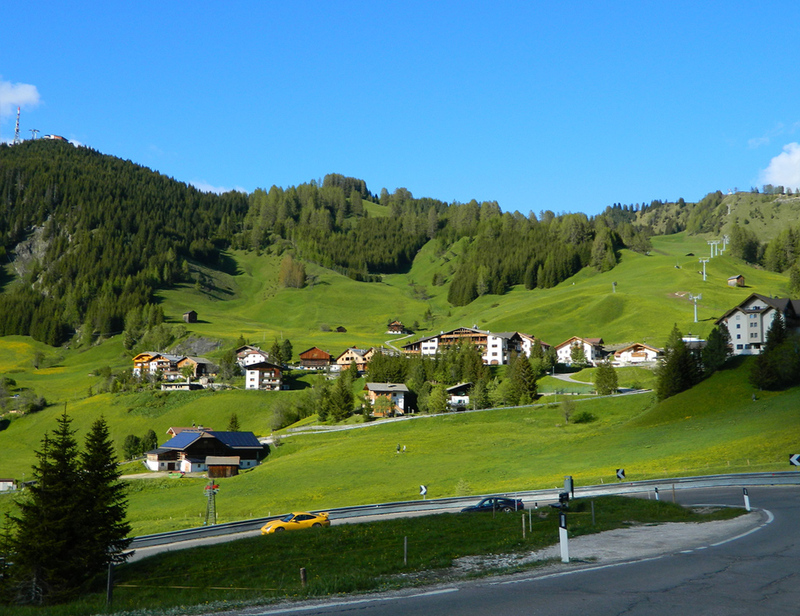 One of our number had decided not to drive the Grossglockner so was already at the hotel in Gerlos. We were now stuck back in Lienz and with the Grossglockner closing before we could go back that way, the only route was back into Italy and then around Innsbruck ... a 3.5 hour stint that would have us at the Gerlos hotel after 11.30pm. After a very very long day already our only option was an impromptu stay in Lienz and then add some extra driving to the itinerary tomorrow. It was a real shame because it slightly soured what was an excellent day. Also, a certain Otto Heess was in attendance at Gerlos, Porsche 917 mechanic during the Gulf/le mans/Steven McQueen/Derek Bell glory days. I gather from Wizard that his tales were massively interesting and he would have loved for us all to be there. Day 9, the swansong. 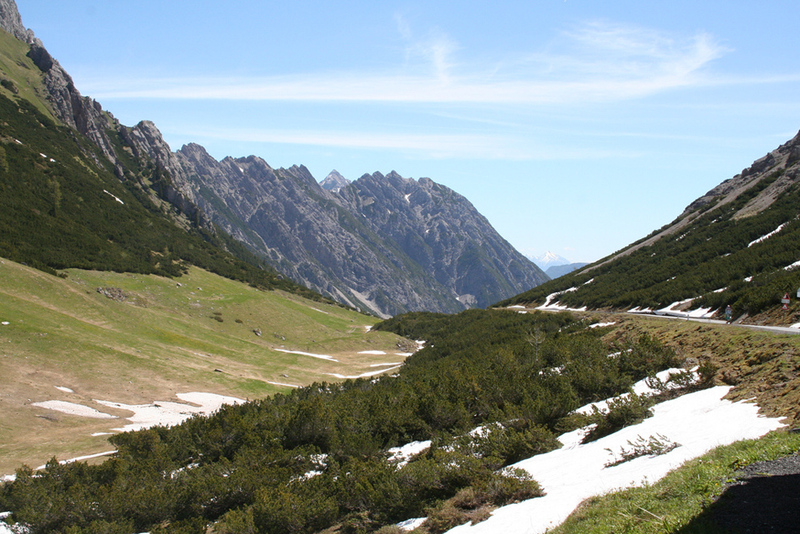 A jaunt up to the Black Forest taking in the highly recommended Hahntennjoch, a 29km 1894m mountain pass that connects Imst to Elmen. As above, our route was intially changed for this day. A blocked road north to Gerlos meant that we started from Lienz again putting an extra 100 miles or so onto the days proceedings. Here I am going back through the Italian border on the E66. This was the same run we entered Austria by but early morning in the opposite direction it was an absolute procession and no fun at all. 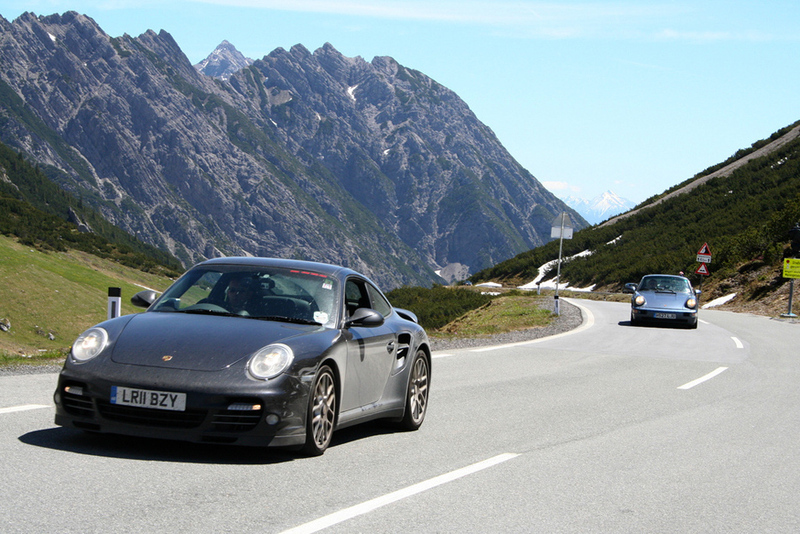 Eventually we battled all the way to Innsbruck and hit a bit of motorway. 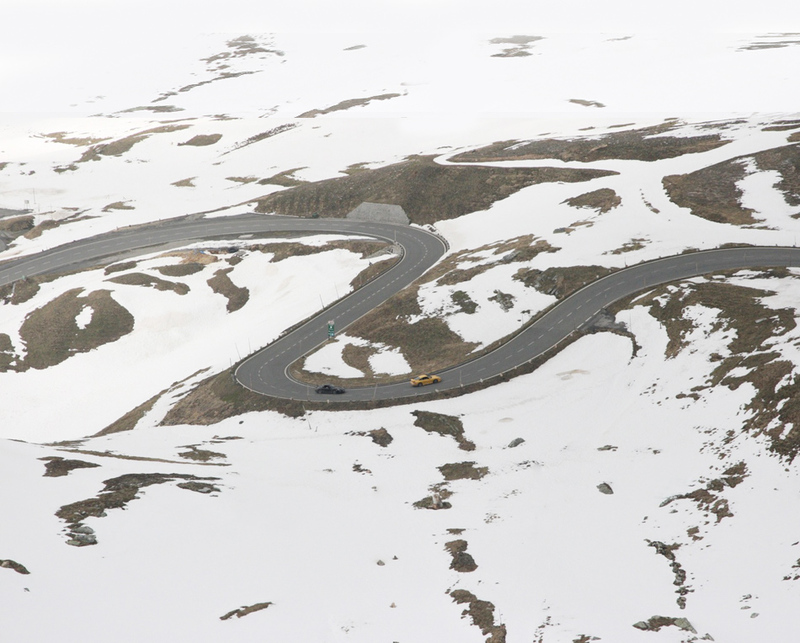 It was then time to come off the motorway for some pretty nice roads and on through the Ski resort of Kuhtai. Out of Kuhtai, past this beautiful dam and the route then turned right up a a really nice high mountain road at Hopperg. Descending down again we rejoined the motorway for a bit and then head for Imst and the Hahntennjochh. 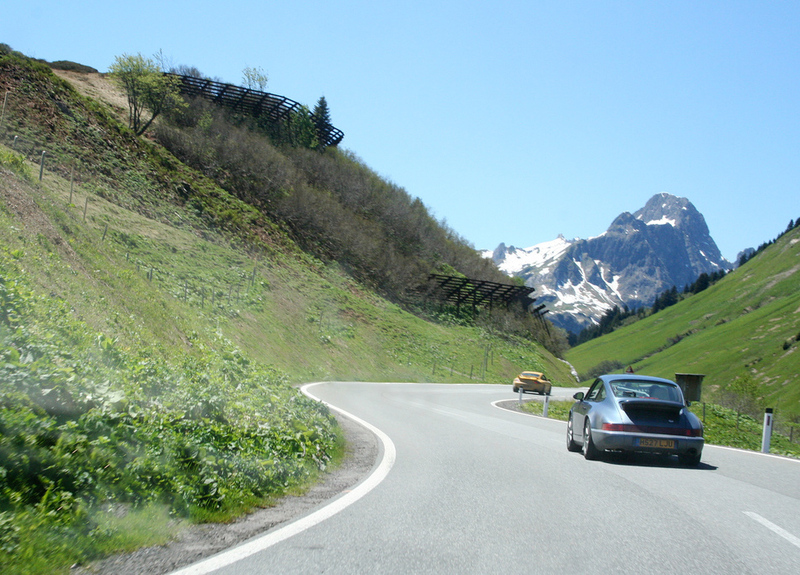 The Hahntennjoch was a great road and very very pretty but not really one for real spirited driving. It was VERY touristy here with lots of bikers, many of them hugging the centre line in the oncoming lane. The tarmac was also curiously slippery in many places and overall we all didn't feel like caning it too much. It's a beautiful setting though and the cafe at the top is a great place to hang out and see other cars. The obligatory passing cattle shot. A little further on we stopped for some lunch. This was high altitude and the sun was extremely hot. After lots of traffic and a very slow dull procession along teh shore of Lake Constance (I would personally go the swiss route and pay the vignette, it will be worth it in the long run) and another blocked road or two, we finally rendezvouz'd at the bottom of the black forest near Waldau. 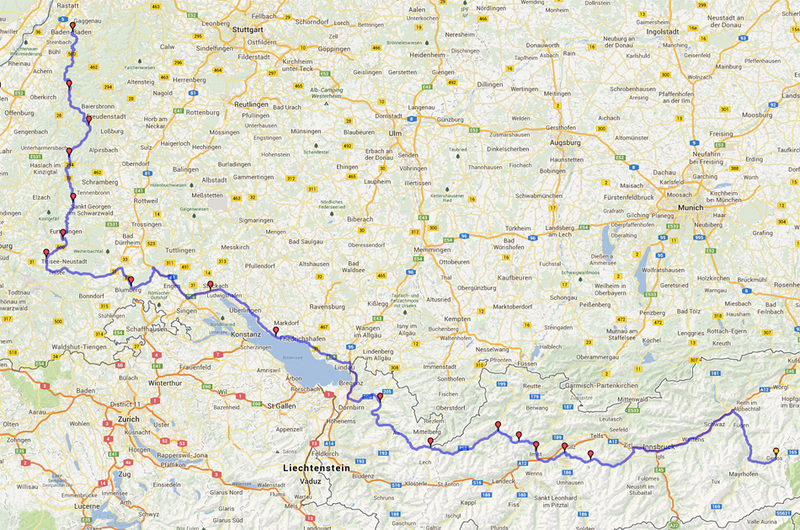 I have to confess though I made a bit of a balls up of the Black Forest route. We had an incredible run through here last year and this time I decided to alter things a little but we just ended up going through village after village. It was really frustrating as this was our last couple of hours of real driving. Finally though, me and Chimp were rewarded when we joined the B500. We had an hour long blast which was the most atmospehric of the whole trip. The sun was setting and some really dark dramatic clouds were forming over the forest. 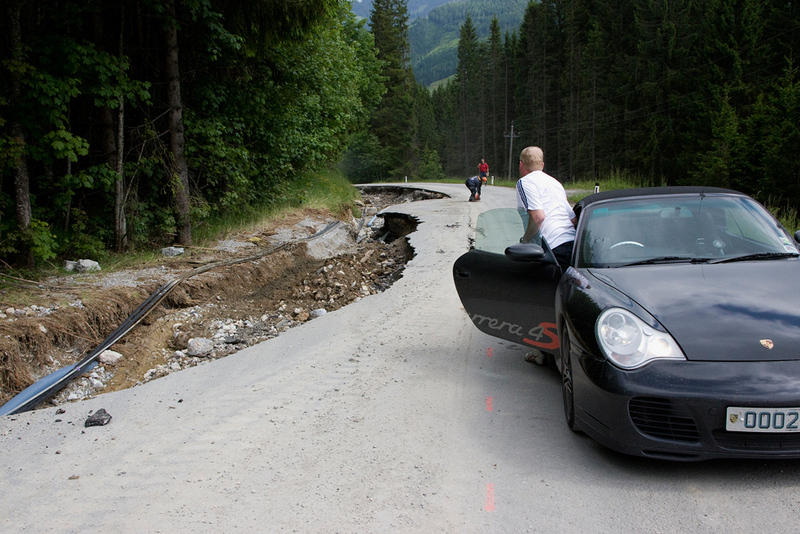 At one point we rose up a curve and hit a plateau and cloud seemed to be skimming the tops of our cars. Glancing left over the sheer edge we could see a huge menacing cloud extending all the way into the distance, its lower surface level with our eyes. We were basically skimming the bottom of cloud and privy to the microdynamics of these things at their very extents. Huge eddys of textural mist werre swirling across the road, carrying leaves and debris with them. The cars thundered through thick and thin patches, it was like entering Mordor with the wrath of the gods visible in the heavens overhead. The road was great too. Very very fast and wide with lots of controlled technical driving through some beautifully smooth curves. The rain started pattering as well and a few twitches from the GT3 meant a measured approach out of the slower corners. The GT3 is so good at that though. That drivetrain is so linear, so exact that you can dial in the power and speed with very fine adjustment. It empowers you with an ultimate sense of control, a toatally uncontaminated and pure input output relationship. My feeling is that it's this linearity and precision, this honesty and accuarcy of delivery that is at the heart of the GT3's soul. 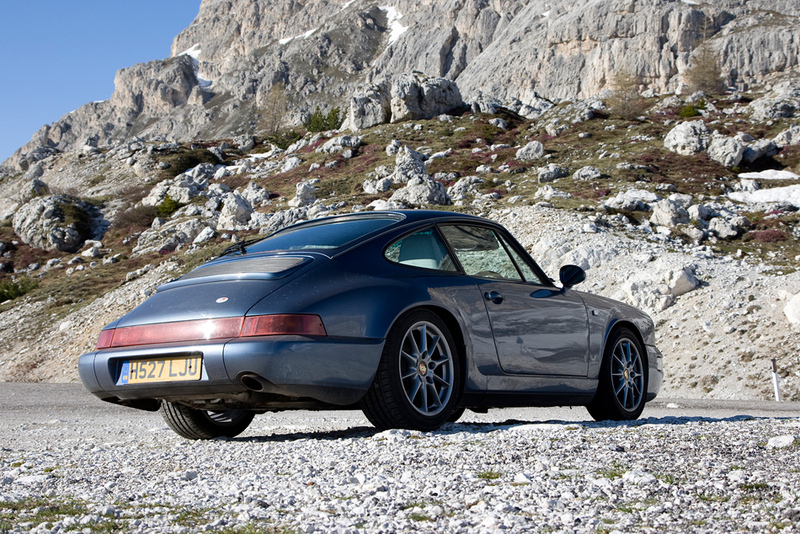 Apart from the 996RS, no other 911 that i've driven has this same pure instrument like quality in so much abundance. Straight to the place that sells german beer when we hit Baden Baden. A few heavy eyelids before we'd even finished pudding ! The final day. A leisurely run straight to calais through unrestricted Autobahn, Luxemberg and Belgium. So there you have it. 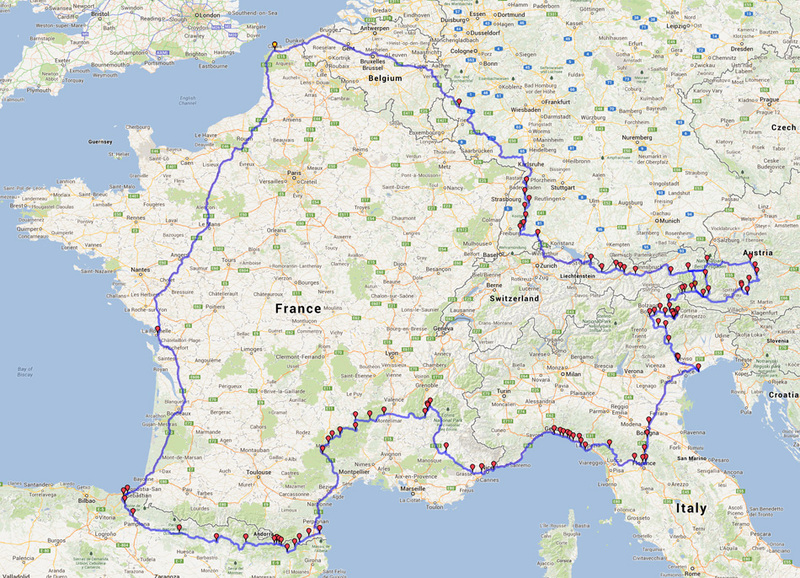 One amazing trip and it's been a fascinating and very intense way of getting to know the GT3. There is so much to tell and to expand upon. So much so that I decided to write a completely separate piece about the Gt3 and how it compares back to my highly modified 993. Read on here if you are interested.